Abdul Raufu Mustapha, who died on 8 August 2017, was a Professor of African Politics at Oxford University in the United Kingdom. 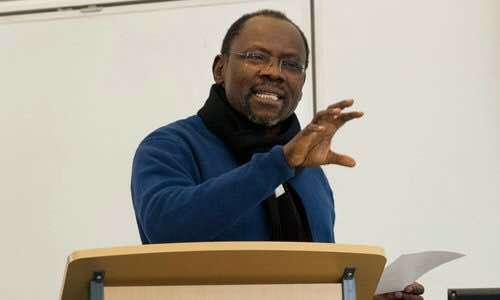 Raufu was a towering presence in African academic networks and will be remembered as a sterling scholar and a committed comrade who devoted his life to leaving the world better than he found it. For Raufu, the purpose of life was the construction of a better society and he had a clear idea of what such a society meant – more equality, more opportunities for all, access to qualitative and critical education and above all, catering for the needs of all members of society. What was important about his life was that he always believed that a better society was possible and we all have a role in bringing it about. In other words, his life was about our agency in constructing a better society. Raufu was born in Aba, Eastern Nigeria on 24 July 1954 and was the ninth of 19 siblings, all of whom are still alive. His father, who is also still alive, is Ishola Mustapha from Ilorin, a retired foreman and mechanic at Niger Motors and United Africa Company (UAC) while his mother, Rabia Mustapha, was a trader. He started his education at St. Michael’s Primary School, Aba and finished at Fagge Primary School in Kano before going to Federal Government College Sokoto. After A-Levels at Ilorin, he proceeded to Ahmadu Bello University, Zaria where he emerged as the best student in political science in 1977 and the best graduate student of political science that sat for the 1979 examinations. Having lived and schooled in Aba, Kano, Sokoto, Zaria and Ilorin, Raufu was fluent in Igbo, Hausa and Yoruba languages and felt at home in all parts of the country. Nigeria, for him, was his extended family. Raufu had the good fortune of being married to a friend and intellectual soul mate, Kate Meagher, originally from Canada. They met in Sheffield in 1988 and married in Toronto in 1990. Dr. Meagher, a sociologist who taught for six years at the Institute for Agricultural Research of Ahmadu Bello University, is currently an Associate Professor in the Department of International Development of the London School of Economics. They had two children, Asma’u Ajoke Laide Meagher Mustapha, born 1993, and Yahaya Oluseyi Mustapha, born 1995. Family for Raufu was however not just the nuclear one, but also his vast extended family and the larger Nigerian and African family. Raufu had exceptional social skills that enabled him to maintain and sustain a vast array of friends, many from his days in primary and secondary schools. He devoted a lot of the one resource he had very little of, time, to contact his friends, visit them, socialize, stay in touch with the evolution of their lives and families, and to generally sustain his rich network of friendship. He included time for his friends in his numerous travels, going out of his way to visit friends and maintain relationships. His kindness, charm, humour and cheerful banter made it easy for his friends to appreciate his value and contributions to their lives. Raufu is best known for his scholarship. After his masters at Ahmadu Bello University, he did his PhD in Politics at Oxford, under the supervision of Gavin Williams. After his long sojourn as a lecturer in Ahmadu Bello University, he transferred his services to Oxford University where he worked for the rest of his life. He was a committed scholar and was well versed in multi-disciplinary approaches and methodologies. He had a formidable presence in African academic networks and was a valuable member of CODESRIA, the organisation that hosts the African social science community. He was a member of their Scientific Committee and recently participated in the internal review of their Intellectual Agenda. Raufu was always available and keen to provide insights into the state of Africa’s social sciences and its future in a changing global context. Over the past two years, he invested time and resources to seek the support of the Dangote Foundation to establish a scholarship scheme. For Raufu, scholarship was the scientific expression of the political values of the researcher. The promotion of social change on the basis of scientific and critical thought through the pursuit of a progressive agenda that prioritises the interests of ordinary people was central to his research. At the same time, he addressed the challenges to social cohesion posed by identity politics – ethnicity and religion identity in particular. In all of his work, he promoted democratic culture, its values, principles and practices. In 2008, he co-edited Gulliver’s Troubles: Nigeria’s Foreign Policy After the Cold War; and edited Conflicts and Security in West Africa in 2013. He served on the Boards of journals, newspapers, and research centres, including the Review of African Political Economy, Premium Times in Abuja, and the Development Research and Projects Centre in Kano. Raufu is very much the product of the radical politics that characterised Ahmadu Bello University during the 1970s and 1980s. He was also a leading cadre of the radical movement and two examples of the role he played are worth citing – the Movement for a Progressive Nigeria and the Zaria Group. Throughout his undergraduate days in Ahmadu Bello University – 1974-1977, Raufu was one of the leaders of the Movement for Progressive Nigeria (MPN), the incarnation of the radical Marxist philosophy and praxis that marked the period. Radicalism for Raufu meant breaking the bond between imperialism and the Nigerian (African) State as a precondition for emancipating the people from oppression and exploitation. Central to this approach was understanding imperialism as a world system with tentacles in the economy, trade, ideology and politics of affected societies. Throughout the period, he worked tirelessly organizing Marxist study cells, identifying comrades who could be recruited and trained and above all, linking the activities of the MPN to the key questions of the time – combating apartheid and the racist regimes of Southern Africa, promoting the just struggles of the Palestinian people, organizing against military dictatorship at home and activating links between the student and trade union movements. Under his leadership, the MPN became a formidable force in the University that was able to influence the leadership of the student union and the radical agenda that characterised political life on campus and across campuses, as he also linked up with other radical organisations in other institutions. A considerable part of his time, energy and intellect during his student days were devoted to these issues, which are not reflected in his CV. Raufu also invested considerable talent and commitment to ensuring that good new leadership emerged, which could sustain the movement after his graduation. Immediately after his National Youth Service Programme in Kano, he returned to the university as a graduate assistant to continue the struggle. Upon graduation, Raufu transited to the Zaria Group, the Marxist Movement composed of lecturers and intellectuals that provided leadership for radical thought and praxis as well as linkages to the larger Nigerian, African and international struggles. The Zaria Group was not the only leftist group in the university. There was another group of radicals that was to later align with the left-wing Peoples Redemption Party that pursued Aminu Kano’s pro-talakawa (common peoples’) struggles. It was a period of intense factionalism and Raufu devoted his time, energy and skills to promoting the “correct” Marxist-Leninist understanding of the problematic. That story has still not been told but with more members of the Zaria Group transiting to the next world, it will be useful to tell that story. One of the occasions to deepen the internal debate among progressives was the Karl Marx Centenary Anniversary Conference, jointly organised by the various strands of Marxists and Progressives in Zaria in 1983. Raufu presented a thoughtful and incisive critique of the People’s Redemption Party experience [the PRP, formed in the late 1970s, was a party of the progressive left and had considerable support], entitled “Critical Notes on the National Question: Practical Politics and the People’s Redemption Party.” It was a major contribution that provided room to revive the debate on the contending pathways to progressive change. Raufu’s most important commitment involved addressing the challenges to social cohesion posed by identities – ethnicity and religion in particular. One of his most important research interests was ethnicity and the national question. He took the task of constructing and stabilizing Nigerian federalism seriously throughout his career, and invested his skills in producing a better understanding of ethnicity in Nigeria’s political system. In 1986, he published “The National Question and Radical Politics in Nigeria” in a special issue on Nigeria in the Review of African Political Economy [all of Raufu’s article can be accessed for free by logging on/registering here]. He also extended this commitment to improving our understanding of the Boko Haram insurgency. Some of Raufu’s most important works were carried out over the past five years and were devoted to promoting a scientific understanding of the Boko Haram insurgency and seeking pathways to peace. Over the period, he has worked with around twenty younger researchers from Nigeria, Niger and Europe, producing a corpus of seminal work that is empirically based and theoretically sound. The work addresses Muslim identities, Islamic movements and Muslim-Christian relations. The researchers have closely examined the factors that promoted Islamist radicalization, the paths that have emerged and the reasons that made Borno the ground zero of the insurgency. They have also examined the research question: why Islamist radicalization occurred in Northern Nigeria but not in Southern Niger, which has the same sociological, religious, geographic, linguistic and cultural characteristics. The research has so far resulted in two important edited volumes: Sects and Social Disorder: Muslim Identities and Conflict in Northern Nigeria”, published in 2014; and Creed and Grievance: Muslim-Christian Relations and Conflict Resolution in Northern Nigeria, to be published in January 2018. The projects on Boko Haram have also produced many policy papers that have been made available for the use of government and its security agencies as well as the community of scholars. Thanks Jibran. Briefly worked alongside Raufu at Oxford. I once asked him how people survived malaria where it was endemic and there were no resources for medication or even nets. He explained that many kids died the first time they got it, but had slightly better resistance the second time, better still the third, etc, until by about the 40th time people were immune. I don’t know if this is true, but it stuck with me. Thank you for this piece on AbdulRa’uf. I knew him only in the past 10years through our activities in the Foundation for Good Governance and Development (FGGN), UK. He had an infectious enthusiasm about political ethics. He offered us intellectual support in the recent political developments in Nigeria. May His Soul Rest in Peace and may Allah SWT grant him Aljannatu-fir-Dausi as his final abode. May Allah grant the family the fortitude to bear the loss. May Allah admit Raufu into Jannah. I had the privilege of being his guest for a week in Oxford and he was exceptionally gentle ,inspiring and many more .It was apparent to me he was a busy man but he made time for me as a guest and sure he left a lasting impression on me . A few weeks earlier he rang me in Leeds when I lost my wife to encourage me .His voice still rings in my ears as I struggle to write this . When I eventually met him in Oxford he went over the whole subject and many other subjects from academics ,though political ideology to religion and life generally. .